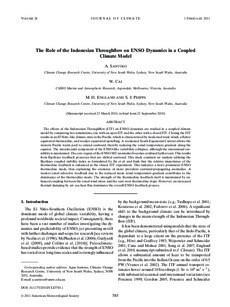 The effects of the Indonesian Throughflow (ITF) on ENSO dynamics are studied in a coupled climate model by comparing two simulations, one with an open ITF and the other with a closed ITF. Closing the ITF results in an El Nino–like climate state in the Pacific, which is characterized by weakened trade winds, a flatter equatorial thermocline, and weaker equatorial upwelling. A weakened South Equatorial Current allows the western Pacific warm pool to extend eastward, thereby reducing the zonal temperature gradient along the equator. The interdecadal component of the ENSO-like variability collapses, although the interannual variability is maintained. The core region of the ENSO SST anomalies becomes confined farther east. This results from Bjerknes feedback processes that are shifted eastward. This study conducts an analysis utilizing the Bjerknes coupled stability index as formulated by Jin et al. and finds that the relative importance of the thermocline feedback is enhanced in the closed ITF experiment. This indicates a more prominent ENSO thermocline mode, thus explaining the existence of more prevalent eastward-propagating anomalies. A weaker zonal advective feedback due to the reduced mean zonal temperature gradient contributes to the dominance of the thermocline mode. The strength of the thermocline feedback itself is maintained by enhanced coupling between the zonal wind stress and the east–west thermocline slope. However, an increased thermal damping by air–sea heat flux dominates the overall ENSO feedback process.